The 5865-3 and 5865-4 LED annunciators provides the most cost effective and convenient means of remote annunciation. 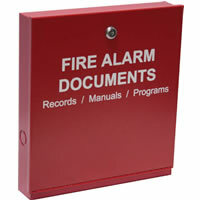 You can use up to eight 5865 series annunciators on one IntelliKnight Control Panel. The 5865 series annunciators provide you with 30 programmable LED (15 red, 15 yellow) for maximum flexibility. The 5865-3 and 5865-4 fit into a standard 3- or 4-gang electrical box; covered by semi-transparent labels and an eye-pleasing cover plate. The 5865-3 provides alarm and trouble annunciation for 15 zones while the 5865-4 adds reset and silence input switches for even more versatility. The 5865-3 and 5865-4 LED annunciators provides the most cost effective and convenient means of remote annunciation.